This is a coordinating item for my lesson plan on tints and shades-apple painting. 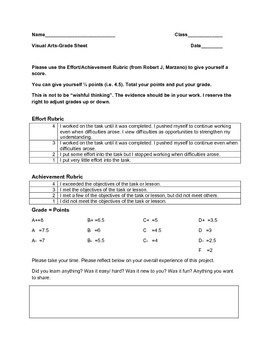 It is a self-evaluation for students to comment on their work and give themselves a grade. It is very helpful as a time saver when grading projects. I find most students who use this rubric are honest with themselves and me. It uses Marzano's "Effort and Achievement" rubric.